Just like any other band, Break of Reality spends its time writing music and performing concerts. The band has released three albums to date and travels extensively around the U.S. giving concerts at performing arts centers, rock clubs and colleges. Over the last ten years, Break of Reality has also spent time doing something a bit different: The group has visited hundreds of public schools around the country, giving educational workshops and concerts, inspiring young musicians to think outside of the box with their classical instruments. Today, funding for the arts is diminishing. Less money is being made available for music programs in public schools. This prevents music teachers from buying new instruments, updating technology in their classrooms, and hiring music groups like Break of Reality to visit their schools. *On January 20th, 2014, Break of Reality’s Kickstarter campaign was successfully funded with over $50,000 in pledges from Break of Reality’s fans and supporters! Without this funding, the tour could not have happened. All of this funding will go entirely toward the tour’s direct expenses. The band has donated its time for the tour and its members will not receive any compensation from these funds. 10 schools. Thousands of music students. All in one month. Break of Reality has partnered with 10 schools around the U.S. to create an itinerary for a month-long tour. During this tour, the band will travel to each school and spend a day with its music students, giving educational workshops on rock music, composing, and all things Break of Reality. In addition to these workshops, the group will give a free concert at each school that will be open to the public. Donations will be taken at each of these concerts, and all donations will go to that school’s music program, to buy and repair instruments and invest in technology. The band aims to raise over $50,000 total for public school music programs around the U.S.
1. To inspire young music students around the country. 2. 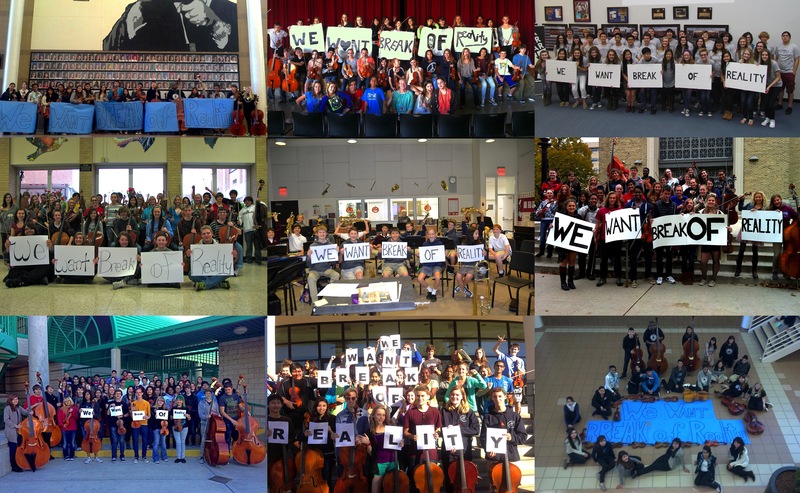 To raise awareness of the importance of music education in public schools. *By taking donations at each school concert, Break of Reality hopes to raise over $50,000 for music education over the length of the tour. Break of Reality is really excited to embark on this tour and to raise funds for music education. Stay tuned for blog entries and updates from the tour!